Fatties no longer exists on Phi Phi Island as it moved to Chalong Phuket after the tsunami. This is an article about the way it was, a real classic dining experience, made in a really unique setting by a classy character. It has now been replaced by other classic dining experience of Unni’s Italian Restaurant. Fatties restaurant is all about JP. A big man with a big heart he is both the head chef and the convivial host. JP has created a glorious venue for excellent dining and drinking. Spacious because of its vaulted ceiling and yet cozy due to its long windy bar the clever design makes you feel at home immediately. 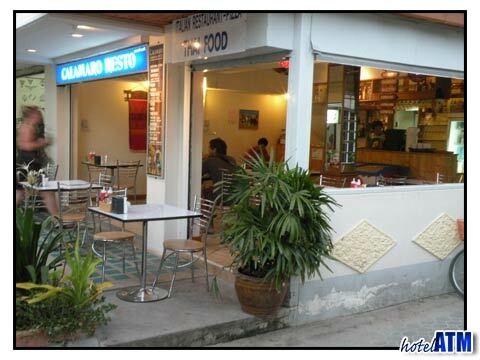 It is greatly favoured by those who live on Phi Phi, a sign that quality and pricing are fair, the atmosphere sincere. BIG FOOD... Food that you look across the plate and wonder if you can finish. My favourites are marinated pork steak, ostrich steak and Greek Gyros. Pudding rarely comes into it because of the main course and I usually side with sticky sweet chocolate ice creams with toffee syrup. To name all the German biers, real off their pedigree, and describe how they must all be poured would take too long in this article so check it out for yourself. PS check to see when the weekly Bar B Q is on... this is a must. The smoker does those sausages to a tee. As you walk into an enclosed courtyard you enter another world where east meets west. Tropical plants, ironwork depicting Buddha’s, a freshwater fish tank full of exotic species, all blend with the lighthearted and easy going manner of JP. As a guest house it didn't last the season, as the first big dance bar it became big but couldn't keep up with the new developments but as a Phi Phi restaurant it has really found it's mark. Unni's restaurant has developed into one of Phi Phi island village's most respected dining establishments. Smart quality menu and a good range of wines at a fair price. Reservations advisable.